My name is Amy and I live in Madison with my boyfriend, our two German Shepherds, Donovan and Corbin, and our cat, Tyler. I was a US Army Military Police Narcotics Detector Dog Handler for three years and grew up with a Rottweiler/Golden Retriever mix, so I have a soft spot in my heart for large breed, sometimes misunderstood, dogs. 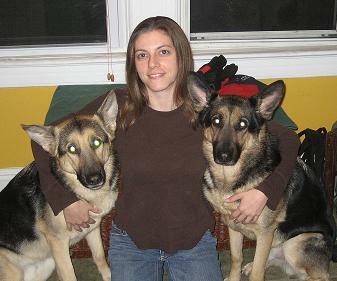 I also worked at The Seeing Eye, Inc as a kennel assistant for three years, where my boyfriend and I were able to adopt our German Shepherds, who were medically rejected from the program. I have been pet sitting for friends and family since I was in high school and thought this would be a good employment opportunity while seeking a degree in Business Administration. I absolutely love animals and have an interest in animal behavior and animal assisted therapy. I am honest, hard working, and can provide you with the peace of mind that your pets will be taken care of in the best way possible.